State fairs are as American as apple pie, and what better place to have a slice of pie than at the fair? At the Big E I had a big piece of "bumbleberry" pie. I'm not exactly sure what was in it, but there had to have been at least three different kinds of berries, and maybe rhubarb or apple. 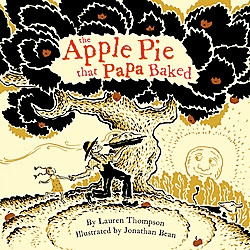 For kids, we have some great picture books with stories that revolve around pies! The best part about reading about pie is you take in zero calories! Okay, today's the day I show you the trade show aspect of the fair. EVERYTHING is for sale at the Big E! A Boston Red Sox hanging fish tank. Art or kitsch, depending on your point of view! If you're short of cash, don't worry, ATM machines are conveniently located. In case you were wondering, no butterflies were harmed in making this art. A demonstration of the wonders of artificial chamois. Pez dispensers to please everyone! Candy apples as big as your head! Who doesn't want a toe ring? In case you didn't believe the dog treats are yummy, there's a dog to demonstrate their deliciousness! There must be a market for this kind of stuff--look how big the booth is! Geodes and other sparkly rocks! Had enough? Maybe I'll save the midway photos until next week! Tomorrow I'll talk about some fair-related fare--PIE! One of my favorite exhibits--the butter sculpture! What's a fair without farm animals? A tavern on the green. Yes, I do know these characters! New Hampshire is well represented! You meet some interesting creatures! There's a building devoted to circus miniatures. This photo doesn't do justice to the scene. It's a reproduction of the tent where the circus staff eat their meals. Looking at it reminded me of the popular book by Sarah Gruen, Water for Elephants [F GRU]. If you haven't read it, I highly recommend it! I think this might be a grill! Garrison Keillor has a chapter in his book, Leaving Home [F KEI], called "State Fair." I may read it to compare a Midwestern fair to our New England variety. If you think you can stand it, I have a few more photos to post tomorrow! I didn't post yesterday since I took the day off for a family outing to the Big E (Eastern States Exposition) in Springfield, MA. What a great day I had with my grown kids. Perfect weather, lots to eat and drink, all sorts of things to keep you busy! Many years ago, when my son was still a toddler (he's now in his late 20s), he found a pen and drew all over his hands and arms. When asked what he was doing he told me he had given himself "daddoos." And this was before tattoos became the fashion statement it is today. The boy was ahead of his time. For my upcoming birthday, my daughter wants us to get tattoos. I'll pass since I'm not crazy about paying to have someone cause me pain, but I do like the tattoo she has picked out for us. Until I Find You is the story of the actor Jack Burns – his life, loves, celebrity and astonishing search for the truth about his parents. When he is four years old, Jack travels with his mother Alice, a tattoo artist, to several North Sea ports in search of his father, William Burns. From Copenhagen to Amsterdam, William, a brilliant church organist and profligate womanizer, is always a step ahead – has always just departed in a wave of scandal, with a new tattoo somewhere on his body from a local master or "scratcher." For those of you who like true stories, we have a memoir of a woman tattoo artist, Karol Griffin called Skin Deep: Tattoos, the Disappearing West, Very Bad Men, and My Deep Love for Them All [B GRI]. TV viewers can get their fill of true tattoo stories by tuning into Miami Ink. I briefly mentioned Monty Python when I covered the topic of SPAM's 70th anniversary. On Tuesday, I heard an interview with Michael Palin, one of the members of Monty Python. Palin kept a diary during his early Monty Python years and it has now been released as a book called Diaries 1969-1979: The Python Years. I'm planning on ordering the book this week. It should be in and processed in a few weeks, so check the new book shelves. Now, if you, like me, are a "suggestible" personality, and the mere mention of Monty Python sends you running online, I'll send you directly to the Dead Parrot sketch! The Complete Monty Python's Flying Circus: All the Words [822 COM]. This 2 volume set is great in case you feel the urge to re-enact one of the sketches in your living room! 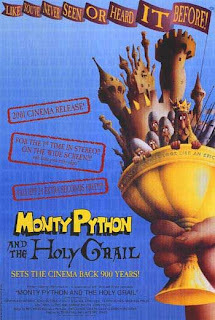 Monty Python and the Holy Grail [DVD MON]. Monty Python Speaks! : John Cleese, Terry Gilliam, Eric Idle, Terry Jones, and Michael Palin (and a Few of Their Friends and Collaborators) Recount an Amazing, and Silly, Thirty-Year Spree in Television and Film--in Their Own Words, Squire! [920 MON]. We also have the complete Monty Python's Flying Circus--14 DVDs worth of sketches [DVD MON]! Enjoy! I've written about theft before in relation to art. But I was listening to a Boston radio station and on their news was a brief mention of another act of thievery perpetrated in New Hampshire--storm drain covers! Of course, being a kurious kitty, I had to find out more. It seems the dastardly thieves are taking the covers to sell as scrap. Good grief. If you're going to be bothered to steal something, it might as well be something truly valuable, like Babe Ruth's 1920 contract selling the Babe to the evil empire. 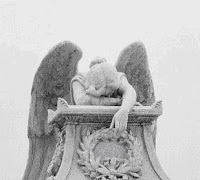 Isn't it odd, though, that in comparing the high profile crimes examined in the above books with the theft of storm drain covers, the "drain covers caper" could have the most tragic consequences. Imagine a child falling down an open drain, or a traffic accident resulting in someone's death. Even little actions can have a tragic aftermath. 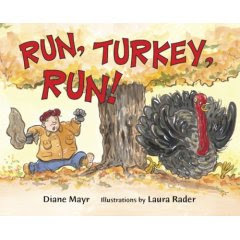 Today, Run, Turkey, Run! by Diane Mayr, a.k.a. Kurious Kitty, hits the bookstores! It's seen numerous revisions, numerous submissions, and numerous rejections (about two dozen) and finally, it has seen publication! If you're interested in writing for kids, I'd suggest starting by reading children's books. Most people, sadly, remember the books they read when they were small, and don't keep up with what's currently being published. It's a whole new ball game! We're always getting new books in, so come browse the Library shelves, or ask Jane or Karen to recommend something. Once you've read about 100 books, you might think it was time to start writing--wrong! You should then borrow a few books on form and technique! Here are two: Writing with Pictures: How to Write and Illustrate Children's Books by Uri Shulevitz [808.068 SHU], and Picture Writing: A New Approach to Writing for Kids and Teens by Anastasia Suen [808.06 SUE]. When you've revised, let your work sit for a period of time and then go back to it. It's amazing how a little distance improves your vision! The last step is to find a publisher. Consult a guide such as the Children's Writer's and Illustrator's Market (the 2008 edition has arrived [808.068 CHI]) before you send anything out--the publishing field changes so frequently that older editions of the books are virtually useless as market guides. If you're lucky, after years of submissions and many rejections, you'll get to see your book at the bookstore and on library shelves. You just have to be patient. In case you didn't know, coming up on Wednesday is International Talk Like a Pirate Day. We've celebrated this festive occasion in the past at the library and we're plannin' on doing it again this year. At 6:00 pm, in our multi-purpose room, we'll be showin' a "G" rated pirate movie (aye, there are such things--we don't wanna be givin' the wee bilge rats nightmares). There'll be grub (popcorn), and grog (drinks), and swag (prizes). If you want to brush up on pirate lingo, borrow The Pirate Primer: Mastering the Language of Swashbucklers and Rogues by George Choundas [910.45 CHO], or if that's not on the shelf, you can watch this video by the TLAPD crew! And, lassies, if ye be wantin' a role model, look no further than here. Tomorrow we will be celebrating our 10th year in the new building. 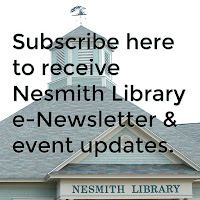 I thought it might be fun to look at the annual report of the Trustees of Nesmith Library for the year ending February 15, 1908. And here's one more figure that I know will have you shaking your head. For the entire year, 1907, the librarian, Bessie Emerson, was paid $60.00! Camping and Woodcraft by Horace Kephart. Dissertations by Mr. Dooley by Finley Peter Dunne. Florence, the Lily of the Arno by Virginia M. Johnson. If Youth But Knew by Agnes and Egerton Castle. With Rogers' Rangers by G. Waldo Browne. Want to know what heating bills were for the year 1907? In 2006 we spent about $12,000! It's so much fun looking back! I hope you'll join us tomorrow from 2 to 4. The Windham Community Band will be performing, speeches will be made, and they'll be lots and lots of homemade cookies! A few weeks ago I heard a story on NPR's All Things Considered about spiders that have been working cooperatively down in Texas. Immediately after, I got one of those nasty earworms--The Who's "Boris the Spider." (On The Ultimate Collection: The Who [CD ROCK WHO].) Of course, now that I mentioned it, I'll be plagued by Boris for the remainder of today. 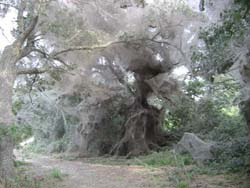 Click here to learn more about the unbelievable web that was spun at Lake Tawakoni State Park. I don't know about you, but I've been noticing lots more spiders this year than ever before. Then, when the story of cooperative web-building came along, I had visions of Alfred Hitchcock's classic film, The Birds [VIDEO BIR]. Okay, so let's rid ourselves of horrible movies scenes in our heads and think about nice spider books like Doreen Cronin's Diary of a Spider [JP CRO], Eileen Spinelli's Sophie's Masterpiece [JP SPI], or the perennial favorite, Charlotte's Web by E.B. White [J WHI]. I had a nice mini-vacation. Part of it I spent writing up the content for my new website. I've decided to hire my son, the graphic artist, to design the site. But, I think the really hard part is deciding on the content. So far I have about 9 pages of a Word document and I'm not finished! I spent some time in Maine over the weekend. We tend to forget the wonderful places we can visit without traveling too far afield. I'd like to suggest you take a ride up to Maine some fall weekend to enjoy the scenery. Christina Tree's An Explorer's Guide: Maine [917.41 TRE] will provide you with destinations. The reason for my trip to Maine was to attend a writers' retreat. 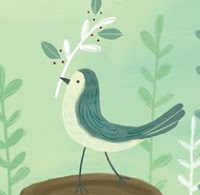 I'd like to put a plug in for the wonderful New England children's writers I met this past weekend: Toni Buzzeo, author of Dawdle Duckling [JP BUZ]; Sandra Dutton, Dear Miss Perfect: A Beast's Guide to Proper Behavior [J DUT]; Melissa Stewart, A Place for Butterflies [JP STE]; Thomson, Sarah L., The Dragon's Son [J THO]; Lea Wait, Wintering Well [J WAI]. And these were only half of the attendees! A great bunch of talented people live in our region! And now a plug for me! Run, Turkey, Run! will hit the bookstores next Tuesday, 9/18! Wish me luck! By now you've heard of the death of Luciano Pavarotti at age 71. Maybe over the next few days you could visit his official website to learn more about him. Today, the site simply has a photo and quote on the main page. For a quick tribute go to Morning Edition at PBS. Even those who are not opera fans could recognize and appreciate the richness of his voice. YouTube has hundreds of Pavarotti clips, including one of Pavarotti and James Brown (of "I Feel Good" fame)! In our collection we have several Pavarotti CDs for you to borrow including The Three Tenors in Concert [CD CLASSICAL CAR]and Luciano Pavarotti Live Recital [CD OPERA PAV]. On a happier note, I'll be taking off tomorrow through Tuesday for a few days' rest and relaxation. Until then, you'll have to wait for the next posting. I hope you'll all survive! for missing last weekend's World Beard and Moustache Championship competition held in Brighton, England! You'll be happy to know that the U.S. team participated. The competition was pretty tough as can be seen by this gallery of bearded and mustached characters. 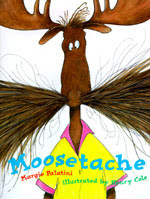 Of course we have a children's book on everything, so you shouldn't be surprised to find this book in our collection--Moosetache by Margie Palatini [JP PAL]. The main character is a moose with a problem--an out of control mustache. (Moosetache was followed by Mooseltoe [JP PAL], which came out several years later. I remember reading aloud Roald Dahl's book, The Twits [J DAH]. The description of Mr. Twit's beard, and its accompanying illustration, were so gross it has stuck in my mind to this day. Mr. Twit didn't even bother to open his mouth wide when he ate. As a result (and because he never washed) there were always hundred of bits of old breakfasts and lunches and suppers sticking to the hairs around his face. They weren't big bits, mind you,, because he used to wipe those off with the back of his or on his sleeve while he was eating. But if you looked closely (not that you'd ever want to) you would see tiny little specks of dried-up scrambled eggs stuck to the hairs, and spinach and tomato ketchup and fishsticks and minced chicken livers and all the other disgusting things Mr. Twit liked to eat. Fifty years ago today, nine students attempted to enter Central High School in Little Rock, Arkansas, with the intent to enroll in, and thus integrate, the school. They were turned away by National Guardsman called up by the governor. 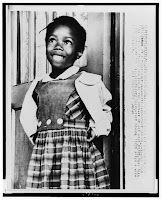 And, you may want to introduce the subject to your kids through The Story of Ruby Bridges by Robert Coles [JP COL]. It is based on the true story of a first grader who integrated an elementary school in Louisiana. It's an incredible story of courage. You can read more about Ruby online at www.rubybridges.com.